The introduction of Internet of Things (IoT) into industrial automation environments, in the name of progress, has brought on both operational efficiencies and security risks previously unseen to the manufacturing, engineering, and mining industries. This article explains the risk drivers behind Operational Technology (OT) systems and the need for comprehensive security across the enterprise’s operations: from IT Security to Industrial Cyber Security. The ability to connect Information Technology (IT) systems with Operational Technology (OT) systems, such as Supervisory Control and Data Acquisition (SCADA) systems and Programmable Logic Controllers (PLCs), gives businesses access to information for a comprehensive picture of what is happening across the enterprise’s operations. It also comes with considerable IT and OT security-related risks that can have a far-reaching impact on the organisation. How does OT Security differ from IT Security? 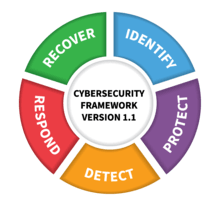 IT security strategies tend to focus on data protection and to follow the objectives of the ‘C-I-A’ model: Data Confidentiality, Integrity and Availability. However, for most OT systems, cybersecurity is not about ‘data’ but the continuity of industrial processes. So, in terms of the C-I-A model, ‘availability’ is the primary focus of security strategies as applied to OT. This is what distinguishes industrial cybersecurity needs from those of other systems, meaning that the even most effective classical IT cybersecurity solution is inappropriate for use on OT systems, putting the availability (and in some cases the integrity) of processes at risk. Cyber resilience: How fast can you return to “business-as-usual”? AVeS Cyber Security is a specialist IT Governance & Architectural services consultancy that combines expert knowledge and services with leading technology products to provide comprehensive Information Security and Advanced IT Infrastructure solutions. Over the past 20-years, AVeS Cyber Security has strategically honed its solutions and services to help Southern African businesses future-proof their IT environments against the constantly evolving threat landscape while achieving their digital transformation aspirations. The company offers a leading portfolio of professional services, products, and training in security, infrastructure, and governance solutions. In 2017, the company won nine awards from some of the world’s top technology vendors, indicating competency, strength, innovation and robustness in an industry that is fast growing in complexity due to evolving challenges such as ransomware, advanced targeted attacks and the Internet of Things.